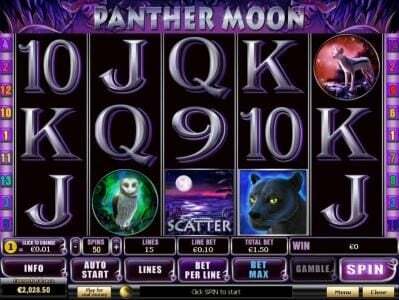 Panther Moon is a free demo 5 game reel slot with a max payout of $50,000 using the animal theme. Panther Moon Slots has not been reviewed yet, be the first to rate this slot. 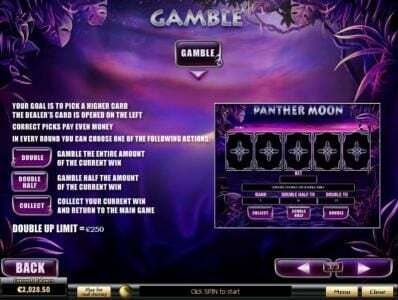 Panther Moon is a 5 reel, 15 line video slot game powered and developed by Playtech offering a massive top jackpot of 10,000 coins and other interesting gaming features to include the Wild Multiplier, Scatter, and the Free Spin Bonus round. In addition, players are able to double their payout using the gamble feature that is activated each time you hit a payout. This slot game can be played on both flash and download client. The software renders cool graphics and animations depicting the panther in full moon and its sound effects can be adjusted according to your preference. During game play, the Slot game showcases a variety of gaming icons to include Owl, Panther, Coyote, Red Flower, Blue Lotus Flower, Shimmering Moth, Ace, King, Queen, Jack, Ten and Nine. Other features rendered by the software include the autoplay feature and the skill stop feature. Panther Moon offers flexible betting limits that suit all types of players. It offers a coin range of $0.01 - $5.00 thereby allowing players to place a max of 10 coins per payline at which penny pushers are able to hit the reels with just a penny while high rollers can wager with a max bet of $750 per spin. Panther Moon offers more than 25 payout combinations giving players an opportunity of hitting a payout on each spin given. The Panther icon is wild and appears on all 5 reels thereby substituting all other reels to complete possible payouts. Each payout completed by the wild is doubled at which it becomes known as the wild multiplier. The wild does not grant any access to any bonus feature game neither does it substitute the scatters. 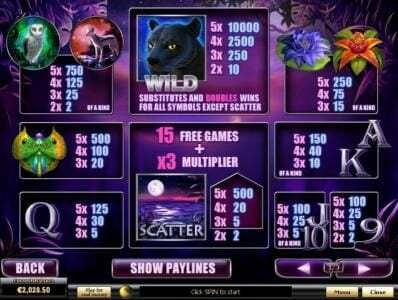 The Panther wild icon triggers the top fixed jackpot of 10,000 coins when 5 wilds appear on an active payline. The free spin bonus round activated by the Moon scatter awards 15 Free Spins and each free spin carried a multiplier value of 3x. This means that your payout is tripled. Additional free spins can be triggered when three moon scatters appear anywhere on the reels. Club 777 under the United Kingdom License | Playtech | Vintage Vegas Slot Machine | $340 at 170% Bonus. This Playtech casino Titanbet.it delivers enjoyable games and slots served with a great 100% bonus all the way up to $1000. This Playtech casino Vernons delivers unique games along with a $10 no deposit casino bonus and a large 400% bonus all the way up to $400.